From the dormers and covered front porch to the deck out back, this relaxed home is classic country at its best. Dormers and vaulted ceilings amplify the integrated foyer, great room, and dining room. Nine foot ceilings throughout the first floor add to the dramatic effect. The kitchen is open to a cozy breakfast bay with access to the deck. The master bedroom is sequestered downstairs. The suite includes a spacious walk-in closet and bath featuring a corner garden tub set off by picture windows. 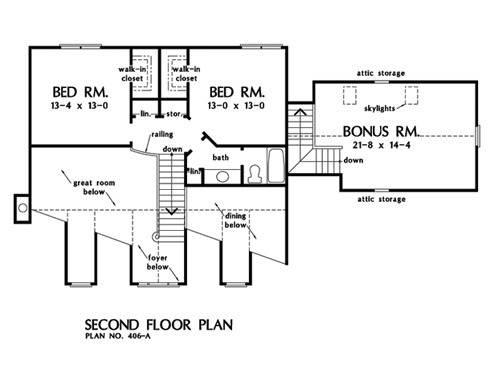 Upstairs, both bedrooms have walk-in closets and share and a roomy bath. A skylit bonus room and attic storage is over the garage. 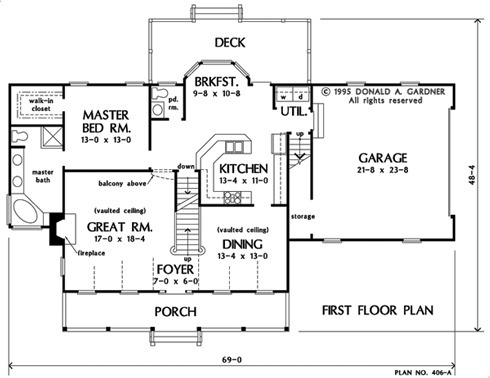 1st Floor: 1380 Sq. 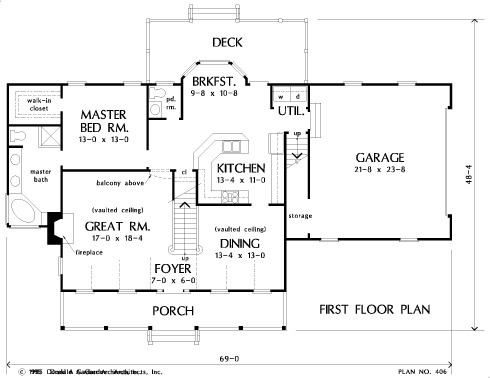 Ft.
House Dimensions: 69' 0" x 41' 8"
Great Room: 17' 0" x 18' 4"
Master Bedroom: 13' 0" x 13' 0"
Deck / Patio : 25' 0" x 10' 0" x 0' 0"
Storage (2nd Fl.) : 3' 6" x 2' 0" x 0' 0"
Foyer (Vaulted): 7' 0" x 6' 0" x 18' 0"
Dining Room (Vaulted): 13' 4" x 13' 0" x 18' 0"
Great Room (Vaulted): 17' 0" x 18' 4" x 18' 0"
Kitchen : 13' 4" x 11' 0" x 9' 0"
Breakfast Room : 9' 8" x 10' 8" x 9' 0"
Utility Room : 5' 6" x 3' 4" x 9' 0"
Bonus Room (Cathedral): 21' 8" x 14' 4" x 11' 0"
Garage : 21' 8" x 23' 8" x 0' 0"
Garage Storage : 3' 4" x 11' 5" x 0' 0"
Master Bedroom : 13' 0" x 13' 0" x 9' 0"
Bedroom #2 : 13' 4" x 13' 0" x 8' 0"
Bedroom #3 : 13' 0" x 13' 0" x 8' 0"